I knew as many of you did, that racism would rear its ugly head under this president. This is why we were disappointed when we learned that some of our friends and even family members were complicit in the scheme to elect this president. America’a history is mired in an ugly past. My ancestors from Africa came here unwillingly. They didn’t give in to slavery, they fought it. Often losing their lives within seven years on America’s soil. Their restless souls and mental capacity couldn’t allow their physical bodies be subjected to something so evil and cruel. Some lost limbs, others were killed to keep the others in order. But they rebelled. Slave masters and their families were killed. But history books leave this part out of the books used in schools. Make America Great Again? To my friends who voted for Trump or against Clinton because you said she was unfit for office, do you still believe he is fit? The ugly head of hate and oppression is showing itself again. The ugly splinter of hate is showing you what we already knew, racism and sexism are alive and well. Tomorrow is the start of the NBA basketball championship. Even the winner will be called world champion. This in itself is a mockery to the game and to the world. When our athletes will not have played international teams. America has a unique way of making it appear that we are the greatest nation on the face of the planet. How is that so, when the game features millionaire superstar African American athletes, descendants of slaves playing for teams owned predominately by white billionaire owners, whose ancestors made money off of free Black labor? These owners are no different in many respects to the slave owners. It is a hard way to look at basketball. But it is the truth and can be said about football and other sports too! The best way, I know to address what we see with this administration is to confront our past. This requires serious introspection and uncomfortable conversations. The Chalkboard is a safe space for us to have some dialogue but the real meat will be in confrontational dialogue face to face. It requires serious dialogue to address questions that will make all of us, even the descendants of slaves uncomfortable. Can we reconcile our past? Only if we are willing to confront it! 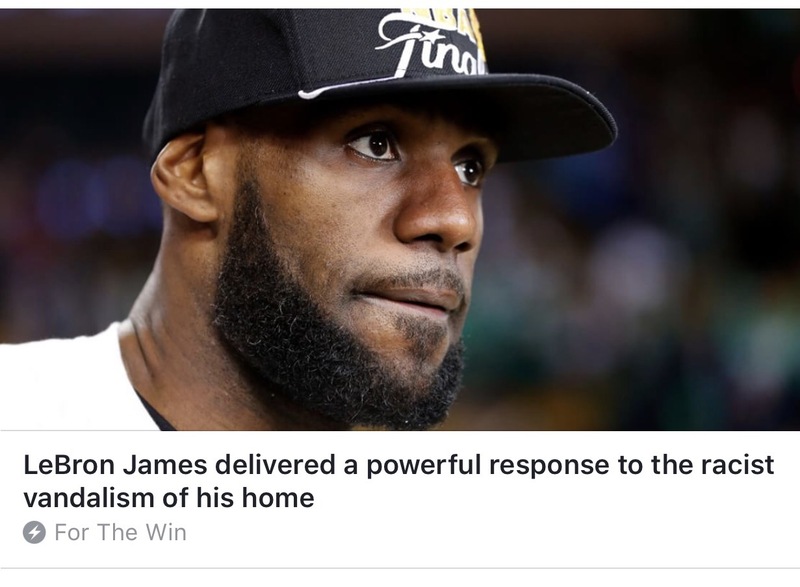 But it starts with letting go this get over it mentality, that Make America Great Again has perpetuated in incidents like LeBron James home being vandalized. Like countless unarmed Black men being killed by overseers masked in police uniforms. To my friends that voted for Trump or a candidate other than Clinton, I still have love for you in my heart because that’s how I’m built. I still have love even for Trump. This will surprise many of you. My love for both is masked in this simple belief. That this had to happen for us to get to a place to have these conversations. I knew then that the death toil would rise. That insecure men would surface thinking they were doing something in the name of Making America Great Again. It is necessary for this to happen to let the racism and sexism of insecure men come to the surface. It’s not pretty. And you are complicit in this crime against humanity. LeBron has my utmost respect. Not for what he and his family endured. My Jewish and Muslim friends at their synagogues and mosques across the nation are feeling what LeBron has. He has my respect as do these religious institutions for standing up with love in the face of hate. Hate will only divide us, love will truly liberate us. U.S. President Donald Trump takes his first trip abroad as commander in chief – starting in Saudi Arabia before traveling on to Israel and Europe. But how might domestic issues derail his foray into foreign policy? To talk about Trump’s domestic woes and Iran presidential election our panel includes: Tara Kangarlou, an international journalist focusing on the Middle East and North Africa. Atiba Madyun, president of the Madyun Group, a government relations firm. Majid Rafizadeh, president of the International American Council. James Jatras, a former U.S. diplomat and Republican adviser and strategist. If he’d never run for president he wouldn’t have the challenges he faces now. It’s arrogance that’s gotten him in hot water. That arrogance has spilled over to the country. If the president says it, believe the opposite. In a world of “alternative facts” don’t be moved by it. Obama gave us the Audacity of Hope. Trump is giving us the Audacity to Lie and his followers have taken the bait. I laughed at Megan’s “audacity to lie” from the start of the show to the end. We were concerned the first few seconds that maybe we’d missed some breaking news to start the show. It takes a boldness to tell these lies. I hope the truth is ready. It has a lot of lies to catch up on! If it’s red call it blue. If yellow call it green. In other words, whatever the president says or does look to the opposite to translate. For instance we can believe he fired Comey because of Hillary, by flipping it as we already have and saying he fired Comey to protect himself. But let’s go back. And you’ve heard me say this before. I’m not letting go. In the debates leading up to the presidential election, Chris Wallace asked the question about the outcome, “will you accept the outcome on election night if you lose?” Trump said if he was the loser he would not accept the outcome on election night because it could be rigged. Hillary jumped all over it “yes I will accept it.” He knew it was rigged and Russia involvement. . But was there also collusion with Fox News? What doesn’t the administration want us to find out? What did they have the audacity to do, to win the WH that they are trying to coverup? Last night I appeared as a guest on CGTN’s half hour news show The Heat to discuss the President’s first 100 days. My favorite question was if in his shoe’s what would I do to improve from a 37 percent approval rating? Take a look!